Dr (Prof.) Sansar Chand Sharma is a renowned Orthopedic Surgeon with more than 35 years of experience. 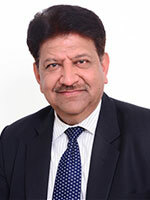 He is an alumnus (MBBS 1979, MS 1983, DNB 1985) of Post Graduate Institute of Medical Sciences, Rohtak. He has additional training in Arthroplasty, Knee Arthroscopy and Trauma at BG Unfallklinik Tubingen (Germany 1995), Beth Israel and Park East Hospitals, Manhattan (USA 1996). He has been senior Professor in Govt. Medical Colleges and founder Director Principal of Govt. Medical College, Nalhar (Haryana). Indian Orthopedic Association has awarded him a prestigious Johnsons& Johnsons fellowship. He has a special interest in arthroplasty and trauma surgery particularly that of the upper limb and hip region. He has delivered more than 100 guest lectures and published 77 papers in the International and National Journals. He has been bestowed upon 5 best scientific paper awards. A.O. fellowship by International A.O. Indian Association of Physical Medicine and Rehabilitation. Punjab University Merit Scholarship 1974-75. Brilliant Student Scholarship during MBBS 1976-78. Silver Medal in Medicine for being First in University Examination. 1978. Awarded Gold medal by National Institute of Health and Family Welfare, New Delhi for being declared as Best Student in Post Graduate Certificate Course in Hospital Management during session 2007. Dr. C. Vyagreshwardu Award (Gold Medal) for the paper entitled “Patter of Residual Muscle Paralysis in Poliomyelitis” during 22nd Annual Conference of Indian Association of Physical Medicine and Rehabilitation held at Tirupati, February 1994. Outstanding Paper Award with cash Prize of 1000 on the paper entitled “Floor Reaction Orthosis for Post Polio Patients” during 44th Annual Conference and 3rd Conference of National Section of International College of Surgeon of SAARC countries held at Indore in the year 1998. Best Paper – 1st Prize on Paper entitled “latrogenic Vascular Injures following orthopaedic operations during 17thAnnual National IMAAMS Conference at Rohtak, October 1998. Outstanding Best Paper Award for the paper entitled “Role of intrathecal alcohol in spinal cord injured patients with intractable spasticity” during Millennium Congress of International College of Surgeons at Chennai, 2000. Dr. V. Mahadevan Best Research Paper Award during XIVth Asia Pacific Federation Conference of International College of Surgeons at Hyderabad, November 8-11, 2001 for the research paper entitled Front to back leg in osteosarcoma of the femur.